If you haven't already done so, please read the Los Alamitos section on the Camera Towns page. Some of Los Alamitos' tickets can possibly be ignored. If your "ticket" does not have the Superior Court's name and address on it, it is what I call a "Snitch Ticket." For more details, see the Snitch Ticket section on the Your Ticket page. If you have a ticket from Los Alamitos - even one you already have paid - be sure to read Docs Set # 6 below, as the City may need to refund a number of tickets issued after Aug. 1, 2015. 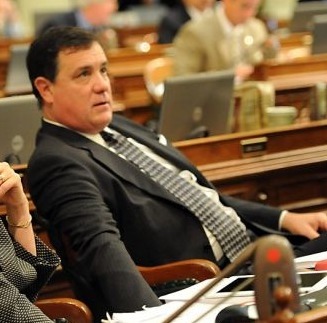 It's predictable that Wagner will go after higher office again. Annual totals, or annual projections, are by highwayrobbery.net. The projections are based upon only the data shown in the table above. The projection for 2018 is based upon Feb. - July only. Except where noted otherwise, the figures given in the table are for the single calendar month indicated. Any figures in red type (or, if you are looking at this table in black and white, the upper figure when there are two or more figures in a cell) are what RedFlex calls Total Violations, or all incidents recorded by the cameras, and due to time limitations may have been posted here only for selected months or locations. If there is sufficient public interest, the remaining months will be posted. The figures in black type are what RedFlex calls Notices Printed, and represent the sum of genuine citations issued (those filed with the court) plus any Nominations mailed (not filed with the court, a.k.a. Snitch Tickets). The official report for this month was generated ten days or less after the end of the month, shows a number of violations "in progress," so the "Approved Violations" figure given in the official report may not reflect the full number of tickets eventually issued. The citywide "Total" Notices Printed figure was adjusted as follows before being posted to the table above: The figure was increased by the number of violations in progress times the % issuance seen the previous year.. If you have an Aug. 1, 2015 to mid-June 2016 ticket from the Katella/Bloomfield camera - even one you already have paid - be sure to read Docs Set # 6 below, as the City may need to refund a number of tickets issued there. Summer 2014 was the first time the City provided bar graphs of Late Times, etcetera, for its cameras. In July 2005 the City signed a contract with RedFlex. "Customer may pay, in arrears, the Fixed Fee for the first ninety (90) days after the expiration of the Warning Period to allow for collection by Customer of sufficient fines to pay the Fixed Fee." The city council approved a new five-year contract with RedFlex in September 2010. The contract says: Definitions. 1.34 "Warning Period" means a period after the Installation Date of the first intersection approach, wherein only warning notices shall be issued, commencing within 3 days after the system has been installed. (Emphasis added.) See Defect # 6. The City agreed to pay $4500 monthly rent for each camera. With annual adjustments for the CPI, as of early 2014 the rent was up to $4576 per camera and the City was paying the full amount, monthly (the 2010 contract did not include a "cost neutrality" clause - see Defect # 10 - B). The City agreed to pay WAY too much. In March 2014 the City of Elk Grove, California approved a new contract which specified the following schedule of rents for their five RedFlex cameras. Over the five years 2010 - 2015 Los Alamitos paid 59% too much (compared to the Elk Grove price schedule), $305,568 extra. To cover that extra rent, the City needed to issue an extra 3056 tickets (assuming that the City's cut of the fine money averaged $100 for each ticket issued). The 2010 contract did not contain an escape clause (Termination for Convenience), something commonly found in other cities' contracts. The contract was to expire in Sept. 2015, so the cameras were on the council agenda of Aug. 24, 2015. The staff report recommended a two-year extension, with no decrease in the monthly rent. On the Saturday before the meeting highwayrobbery.net submitted a letter questioning the amount of the monthly rent and the $30,000 penalty. Early on the morning of the meeting SaferStreetsLA.org submitted an accident study. On the morning of the meeting, RedFlex sent the City a Fact Sheet including some accident graphs and also a table showing that 76% of the tickets were going to visitors. Although there was little time before the meeting, SaferStreetsLA submitted a response to the Fact Sheet. On the public information table at the meeting there was a Program Cost/Revenue Details sheet (author not indicated) showing that in Fiscal Year 2014-2015 the City had ticket income of almost triple what it spent to run the program. During the meeting a councilmember announced that RedFlex had just agreed to drop the $30,000 penalty from the Termination for Convenience (escape) clause. Signed Amendment with Revised Clause. Without that penalty, the City will be able to cancel the contract at any time, on 30 days notice, and walk away Scot Free. The council approved the new contract, unanimously, with discussion by only one councilmember, and without a reduction in the rent. Later in the week the OC Register published an editorial (archived copy) about the cameras in Los Alamitos and Garden Grove. With the $4576 rent (per camera, per month), Los Alamitos would pay triple what it should, $221,472 extra over the two years 2015 - 2017, and would need to issue an extra 2215 tickets in order to cover that extra rent (assuming that the City would get $150 from each paid ticket and that 2/3 of tickets are paid). To see how much other cities pay, see FAQ # 17. The extension was originally on the July 17 agenda, but that meeting was cancelled. The new hearing date was July 31, and the vote was 4 - 1 to approve - Wilson nay. The 2017 amendment reduced the rent from $4576 to $3200 per camera per month, which was still more than double the Elk Grove schedule (above) for cameras ten or more years old, more than double what Del Mar pays (($1578) for its three RedFlex cameras, and 1/3 more than Solana Beach pays ($2386) for its three RedFlex cameras. Assuming that by hard bargaining Los Alamitos could have achieved a target rent of $2400, the City's consent to pay $3200 will cost $115,200 extra over the four years and the City will need to issue an extra 1152 tickets in order to cover that extra rent. This list of contracts and/or amendments was up-to-date as of June 25, 2018. There is a little program info on the police department's website. The links to it are in the upper right hand corner of the Traffic Bureau page. An official report showed that in 2016, 66% of the City's tickets were for left turns. 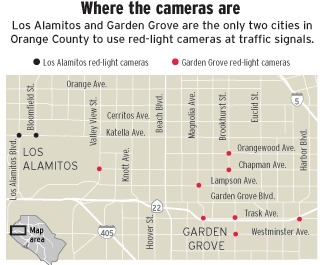 Los Alamitos may need to refund an estimated 1000 tickets issued between Aug. 1, 2015 and mid-June 2016, as it appears the City missed the deadline to set longer yellows at one of its camera enforced intersections. Background: A new statewide rule effective Aug. 1, 2015 changed the method for calculating minimum yellow times. The former rule used the posted speed limit to look up the applicable minimum yellow in the lookup table (see Defect # 2). That table requires a yellow at least 3.9 seconds long for a speed of 40, 4.3 when it is 45, 4.7 when it is 50, and 5.0 when it is 55. The new rule says that the minimum yellow shall be determined by rounding the 85th Percentile Speed of traffic (found in a city's current radar speed survey of the street) up to the next 5 mph increment, and then using that number to look up the applicable minimum yellow in the same lookup table. We received this 2017 document in which an outside consultant examined the City's signal timing. We received this set of documents regarding routine maintenance and repair of the signals, including timing. There may be some more Los Alamitos information posted in the next few weeks. Mark your calendar to remind you to come back here and look!